In Return of the Living Dead the undead are ready to party in a horror comedy of epic proportions. When two halfwit employees of the local medical warehouse decide to horse around with a miss-shipped government load of highly toxic gas complete with its own corpses, a cadaver is brought to life. 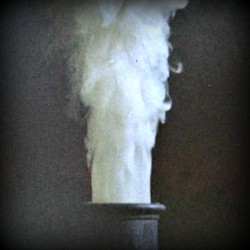 As if this was not bad enough, movie magic does not work on them! So after burning the corpse of one, the rains come and wash the toxin into the ground, to let the party really come alive....well undead! Return of the Living Dead, is what the other half of the creative duo (George A Romero and John A Russo) that gave you Night of the Living Dead came up with as an 'alternate timeline' to Night of the Living Dead, Russo took the 'franchise' in a completely different direction than Romero did. To fully understand what’s going on you have to know the history, but I will save that for Wikipedia. The short version is this: Night of the Living Dead is public domain due to the laws of the time and some snafu when changing it to film. Holds This..... Lets Play With It! Thus, when Russo and Romero had creative differences they were both able to go whatever way they wanted. Romero went on to produce the 'of the dead' series and Russo went on to create "of the living dead" series. Romero gave us many things that we think of when we think of zombie movies, the infectious bites, the shots to the head, and the slow shambling zombie. Russo though gave us the most memorable thing of all, the love of eating brains! 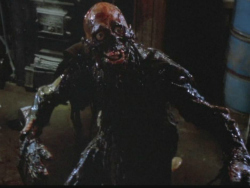 Return of the Living Dead was produced in 1985, and is the first in a series and the franchise has spun completely out of control, with Romero and Russo doing adaptations of their own, and then some 'of the living dead' movies coming out not written or directed by either but with the same name and sequel numbers slapped onto them it’s just pure chaos! But that does not stop this movie from being a good bit of fun! Billed as a horror comedy, I have to say it’s truly both. There were times I caught myself squirming from the visuals (Such as cutting the head off a squirming body), and I am not ashamed to admit that the first zombie you see beyond the headless one gave me the creeps at first! Then some other times I was laughing out loud. Russo went a different route, with zombies that are literally re-animated corpses. They can hear, speak, move at the rate a normal human could, with the strength of a normal human; and in my opinion makes them far more deadly than Romero’s zombies. It also lends itself to more freedom and artistic things to do when it comes to deaths and plot twists. This was made at the same time as Romero's Day of the Dead in 1985 the special effects, I have to say were just a little bit better here, and the plot, characters, and over all story kept me far more entertained than Day of the Dead. Sadly none of the cast made it huge, they had some bit parts here and there and a few went on to be regulars for TV shows, it really makes me sad because they did a great job in this movie, far better than some of the actors that went on to become big thanks in part to Romero's films; but such is Hollywood, all about who you know. With a solid and believable story, realistic reactions from people, some dark humor thrown in, a woman who goes through literally the entire movie naked (except the first ten minutes), lots of gore, and a realistic ending that I applauded for not being another ....well...watch it and find out for yourself, it truly is, in my opinion a great ending. 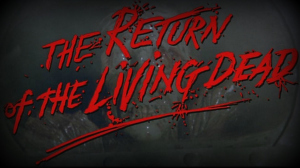 If you are like me, and want to own the great ones for your self so you can share them with others, or just so you don't have to rent them; you can Own "The Return of the Living Dead" On DVD or a Bu-Ray and DVD Combo Pack or even just go to your local store and buy it, if you can find it. No matter how you get it, this is a must watch.